No, this is not an attempt to verify how many riders who own one, I have no statistical data to back up whether riders are a group who dominate the dog-owner federation or not. Why do I write about dogs here on my blog now? Because a back stage picture brought it all back to me today. 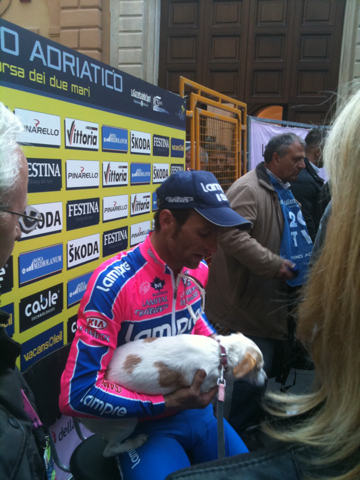 Here is a picture of stage winner of Tirreno-Adratico Michele Scarponi stroking his dog. Dogs can be a riders best friend and its worst enemy. That's enemy if you are a doper. Dogs in cycling first came to my notice when Operation Puerto broke in 2006. The famous, or notorious if you like, Doctor Eufamiano Fuentes, assisted many road cyclists, athletes and footballers to manipulate their blood. Very strange that a gynecolgist is the man to ask for blood transfusions, even more strange that a Spanish football team hires him today after all that have happened. In order to keep control of everything, Fuentes made the riders and other athletes to come up with their pets' name. For many riders it was their dog's name. Joerg Jaksche "Bella", Alejandro Valverde "Piti", Ivan Basso "Birillo", to mention a few. Michele Scarponi was codenamed "Zapatero", but I have not been able to find out if that is the name of his dog. Since the Spanish police found many bloodbags in Fuentes care, a simple DNA-test would quickly dismiss riders who not were involved. But that never happened, because that would be to "put the legal system to the test since everyone is to be considered not guilty until proven so". The blood bag with the initials A.C. was never testet for DNA either, and I hate to speculate on who that might be. Dogs are family and of course they are present whenever the rest of the family do something. Like watch the Tour de France. This is something Marcus Burghardt of then team T-mobile, got a very close encounter of during the tour of 2007. Luckily injuries were avoided, on both of them.